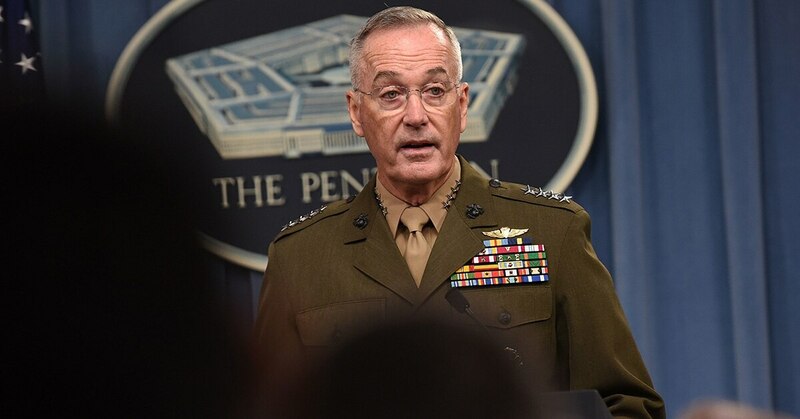 ATHENS, Greece — Chairman of the Joint Chiefs Marine Corps Gen. Joseph Dunford departed the U.S. on Sunday for a week-long trip focused on shoring up Afghanistan’s new strategy by pressing key neighbors Pakistan and India to do more to help stabilize the country. Dunford will first visit Pakistan, alongside Secretary of State Mike Pompeo, to meet with Foreign Minister Shah Mehmood Qureshi. U.S. and Pakistani tensions have escalated over the last year as the Trump administration withheld millions of dollars in military aid over long-standing frustration with Pakistan that it has not taken a more aggressive stand against Taliban and Haqqani network militants who coordinate attacks on Afghanistan from within Pakistan. Last week, the U.S. confirmed it would hold up an additional $300 million in aid to Pakistan, which Qureshi told Reuters on Sunday would be brought up at the meeting. Previous rounds of withheld funds have impacted U.S. foreign military sales to Pakistan, including the transfer of up to 16 AH-1Z Viper attack helicopters from Amarillo, Texas-based Bell. In August 2017, Bell had just transferred the first two Vipers to the U.S. government for transfer to Pakistan via the FMS program when the U.S. announced the first freeze of military aid. Four more helicopters were on the production line. U.S. Army Gen. Austin Scott Miller assumed command of the 41-nation NATO mission in Afghanistan in a handover ceremony on Sunday. The Vipers are still waiting to be shipped, a State Department official said on the condition of anonymity. However, the U.S. still relies on Pakistan to support ground forces in Afghanistan, raising the question of whether Pakistan would retaliate by cutting off access to critical supply routes. The routes, known as Pakistan’s ground lines of communication, or GLOCs, run from the Port of Karachi to major customs gates at the Afghan border. It’s cheaper to get supplies to forces in Afghanistan through Pakistan than it is to fly them in or send them via a northern route that relies on sea and rail transit through eastern Europe and the Caucasus. Between 40 percent and 50 percent of all vehicles, construction material, spare parts and fuel required to supply U.S. and NATO forces deployed to Afghanistan still travels through Pakistan, said Maj. Dave Dunn, a spokesman for U.S. Transportation Command. 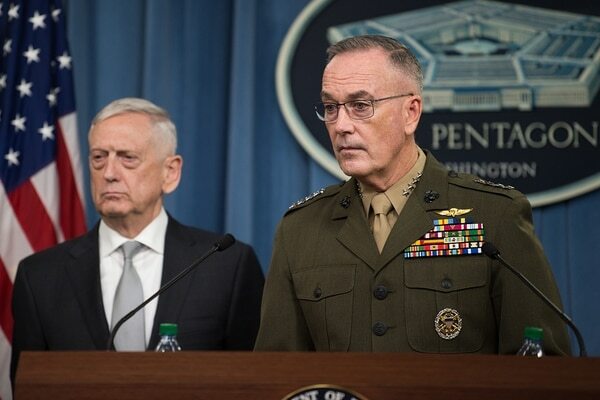 Dunford will next travel to India, where he will join Defense Secretary Jim Mattis and Pompeo to meet with their Indian counterparts, Foreign Minister Sushma Swaraj and Defense Minister Nirmala Sitharaman, for a first-ever 2+2 summit that will not only address India’s role in helping stabilize Afghanistan, but also recognize a growing and strategic defense partnership that has become critical to U.S. interests, to the extent that the Pentagon renamed U.S. Pacific Command to U.S. Indo-Pacific Command earlier this year. Those talks may find some pain points in India’s pre-existing contracts and relationships with Russia and Iran, where the U.S. has imposed strict sanctions. 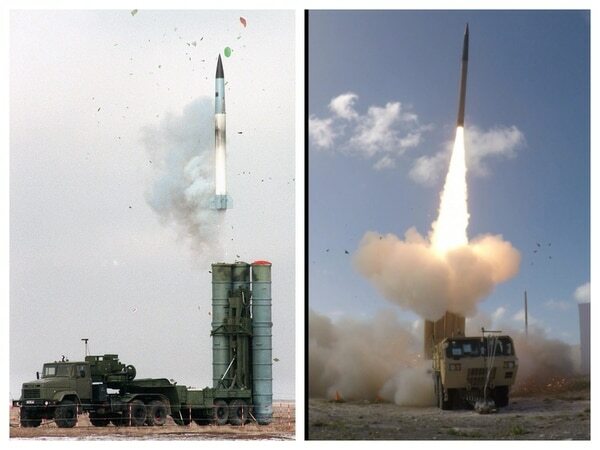 India is close to finalizing the purchase of up to five S-400 surface to air extended range missile systems from Russia in a deal estimated to cost $6 billion. India is looking for a waiver to enable it to go ahead with the purchase without facing sanctions. Defense officials who briefed reporters prior to the trip said they hope India will consider U.S. alternatives to the planned purchase. “We have had a pretty full, wide-ranging discussion with the Indians on how we might be able to satisfy their requirements," a defense official said. Those conversations will‚ however, take into context that India’s defense market has grown rapidly for the U.S., up from zero to $15 billion dollars since 2008," the defense official said, and the U.S. is looking for future opportunities there, both to increase trade and increase interoperability between the two nations’ defense forces. India also remains dependent upon imports of Iranian oil, and India is in the midst of completing negotiations on developing the Chabahar port in Iran. The strategically located port, just south of the Strait of Hormuz, would give India greater access to Afghanistan by a rail line that would run from the port to western Afghanistan. That access could ultimately help India provide more of the stabilizing effect the U.S. seeks in Afghanistan, but any investment now, without a waiver from the U.S., would be the target of sanctions due to the Trump administration’s withdrawal from the Iran nuclear agreement. India is committing up to $500 million to develop the port. India’s Ministry of Defence’s apex procurement body okayed procurement of naval multirole and naval utility helicopters, but induction will not be made anytime soon. If U.S. sanctions prevent that from occurring, it would create “this odd situation where the U.S. is leaning heavily on India to up the game in Afghanistan,” but preventing them from developing a port that would actually help India do just that, said Ashley Tellis, a leading expert on India and Pakistan at the Carnegie Endowment for International Peace. Ironically, the U.S. “[does] need an alternative to the Pakistan GLOCs” as well, Tellis said.